This is by no means a comprehensive look at how we fared this year, just one perspective based on a single graph. One of the things that I pay closest attention to is depth: how many different skiers do we have performing at a particular level. The reason for this is that for relatively “small” skiing nations like ourselves, it can be pretty common for a single extraordinary skier to come along and provide excellent results for several years. This can make the program as a whole look pretty good, but if the success isn’t “filtering down” it probably won’t last. I’ve included the size scale with the points to give you a sense of the “denominator”: how many skiers we actually sent out there in a given season. As you can see, oftentimes is hasn’t been very many at all. The Canadian men have obviously been quite successful recently, but note that Len Valjas is really the only new development lately, in terms of scoring WC points. Also, it’s interesting to me how the Canadian men seem to tend to have a larger number of athletes getting starts than the US, at least over the past 5 years or so. The story with the Canadian women is pretty simple. There’s the big bulge for the Beckie Scott & Co. era and then a pretty steep drop off. 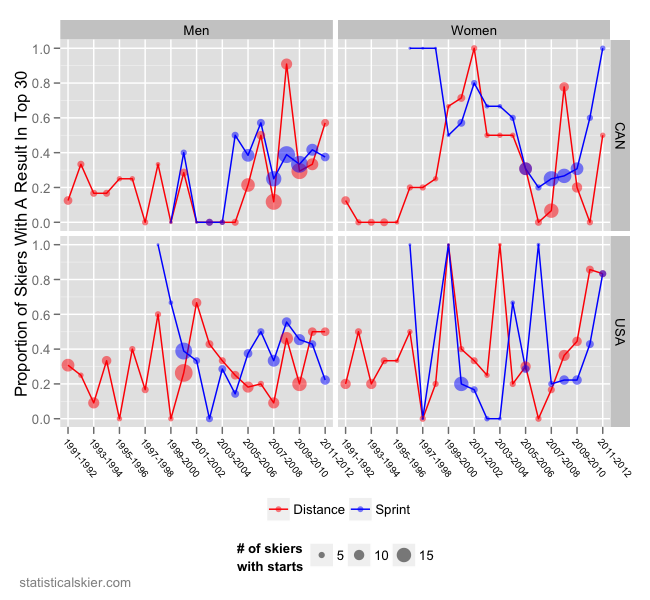 There was a sudden explosion in the number of women getting sprint start between 2008-2010 in the run-up to the Olympics. While that has dropped off considerably, the women they are starting are finally scoring some points (Crawford and Gaiazova, mainly). Their distance results have sort of bounced around. That was basically the beginning of the Kris Freeman era in US men’s distance skiing. Between then and 2008 there a steady decline in the proportion of skiers reaching the top 30, despite a fairly steady 5-10 athletes getting starts each year. Recently, things appear to have picked up somewhat, although this year is basically identical to the last. With the departure of Torin Koos and Simi Hamilton taking a few seasons to get healthy and performing where he’d like, sprinting has also seen a decline over the last several years. That leaves the obvious big bright spot, the US women. For much of this graph, the proportions bounce around very erratically, since we very often had only 2-3 women getting starts. Following a real low in 2007, with no American women scoring points we’ve seen several consecutive seasons of improvement, with a slight drop off this year. The improvement in the women’s sprint events is only ~3 seasons old, but if anything it seems more promising. Posted by Joran on Monday, April 30, 2012, at 6:00 am. Filed under Analysis, Cross Country. Tagged 2011-2012, Analysis, canada, men, north america, season recap, USA, women, World Cup. Follow any responses to this post with its comments RSS feed. You can post a comment or trackback from your blog.